SWIM At the annual Meet of Champions held at Mt. SAC, the boys placed second and the girls ninth. The girls team have had trouble this season, with less swimmers per event and low placements in recent meets. The Diamond Bar High School swim team dove into the season with high hopes of continuing its pool dominance of recent years, and has had success thus far with a 3-1 league record. In the first event of the season, on Feb. 23, DBHS took second place out of 18 schools at the Riverside Poly Pentathlon, an invitational event. The boys tied for first place with Murrieta Mesa while the girls took third. Home team Riverside Poly won the meet over DB, 177-143. Freshman Kaimin Tseui placed first for the girls 50 yard backstroke, the only Diamond Bar athlete to place first. Sophomore Timothy Jia placed second four times for the boys in the 25, 50, 75 and 100 yard freestyle and third in the 200 yard freestyle. 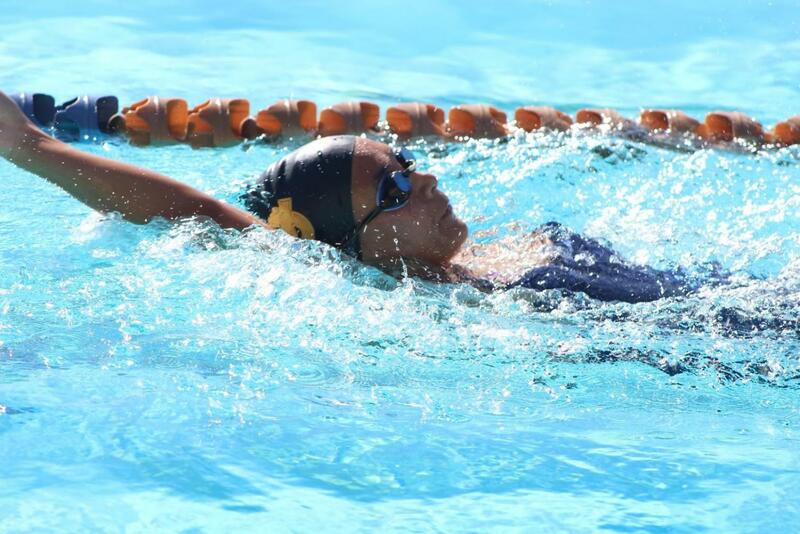 “The Pentathlon may not have been a league meet, but it was very important because it gave us a very good idea of where we are at right now and how much we can improve by the end of the season,” sophomore Hanna Alrez, the swim team’s manager, said. The team’s success did not carry into their first official meet, however. They swam against Chino Hills High School on Feb. 27, but lost. The boys went 87-83, and girls, 97-73. Head coach Darlys Ankeny attributes this in part to low athlete turnout. “[We’ve been working on] getting the team to swim for Diamond Bar High School versus all their different clubs,” Ankeny said. According to Ankeny, the fact that these athletes are so dedicated to the sport that they practice outside of school is good for individual performance, but can be detrimental to the team overall when athletes miss school practice for club events. Not only does this lower the amount of team bonding, but it can also result in some of the team’s best athletes being away during important meets, the coach explained. At their next meet against Walnut High School on March 4, however, athlete turnout increased, resulting in an overall Diamond Bar win 171-169. The girls lost with a score of 98-72, but boys won, 99-71. From then on, Diamond Bar continued their winning streak. At their home game against Montclair High School on March 6, boys won 137-32 and girls, 130-40. The Brahmas enjoyed the same success at their next meet at Chino High School last Wednesday, where both boys and girls won, 131-35 and 140-18, respectively. In a break from league meets, Diamond Bar also went to the annual Mt. SAC Winterfest Championship Events, an event which spans three days. There, the team took third place overall, losing only to Clovis High School and Walnut High School with 749 points. The team placed ninth for girls with 250 points and second for boys, with 499 points—24 short of the first place team, Clovis West. The boys placed first in the 400 yard freestyle relay, one of the two events in which Diamond Bar took first. The other was the 200 yard individual medley, where senior Nathan Chow won first by more than two seconds. Sophomore Vincent Chang also did well, placing second for the 100 yard butterfly stroke. Despite the rough start, Ankeny said that the swim team anticipates winning the league and CIF. To achieve this goal, the team has been practicing its sprints. It has shown in the 50-yard freestyle times, which have improved over last year’s. Aside from individual performance, the team has also faced problems with the overall balance. While last year, the number of boys and girls was evenly split, Ankeny said that the team has less girls than usual, which means that the team often has to reduce the number of swimmers per event. Diamond Bar’s next meet at Ontario High School this Wednesday was canceled due to inclement weather.